Has China Withdrawn A Long-Range Missile Battery From Woody Island? Satellite imagery indicates that a HQ-9 battery was taken off Woody Island on or around July 10. 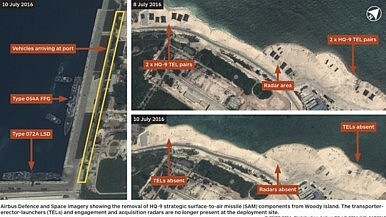 Satellite imagery taken on July 10 by the defense contractor Airbus Defense and Space indicates that China might have withdrawn a HQ-9 long-range air defense system from Woody Island, the largest of the Paracel Islands occupied by China in the South China Sea, IHS Jane’s Defense Weekly reported on July 21. While a satellite image taken on July 8 shows the various components of the HQ-9 air defense system—including three transporter-erector-launcher (TEL) vehicles and a Type 305A target acquisition radar–dispersed and camouflaged, an image taken a day later shows the components uncovered and concentrated near the radar site. “On 10 July, subsequent imagery showed a column of vehicles, including probably HQ-9 TELs, parked on a road adjacent to the island’s southern harbor. A Type 072A landing ship berthed in the harbor represented a possible transhipment option for the equipment,” IHS Jane’s Defense Weekly notes. Although Woody Island has been home to military facilities for decades, it appears that the People’s Liberation Army (PLA) has not constructed adequate missile storage facilities to accommodate the HQ-9 surface-to-air (SAM) missile air defense system on a permanent basis. The most likely reason for the missile’s withdrawal is maintenance, given that the island’s climate—a rainy season that lasts five to six months every year, year-round high temperatures, high humidity, and high salt—is not suitable for the long-term deployment of high-tech missile systems without adequate facilities to house military hardware. The HQ-9 is a derivative of the Russian-made S-300 long-range SAM system and can engage aircraft, cruise missiles, and theater ballistic missiles at a range of up to 200 kilometers (124 miles). China has deployed HQ-9 batteries to Woody Island twice before during military exercises. China removed the missiles two days prior to the announcement of the Permanent Court of Arbitration ruling on territorial disputes in the South China Sea. It also coincided with the conclusion of Chinese naval drills held in and around the Paracel Islands in July. “China has occupied Woody Island (known as Yongxing Island in Chinese) since 1956 and houses a population of around 1,000; China began stationing troops on the island in 2012. The island hosts an airport with a 2,920 meter runway (thanks to expansion and construction in 2015) and an artificial harbor,” my colleague, Shannon Tiezzi, explained in February. While a boost to China’s anti-access capability in the region, the military impact of the stationing of the HQ-9 battery on Woody Island has been minor. As Steven Stashwick pointed out in The Diplomat, a single Type 052C or Type 052D -class destroyer cruising in the waters of the South China Sea carries more HQ-9s than a HQ-9 battery deployed on Woody Island. U.S. and Taiwanese defense officials confirm reports that China set up missile defense systems on Woody Island.